This beautiful looking salad recipe is not only delicious but also full of nutrients– loaded with broccoli, cauliflower, parsley, carrots, raisins, sunflower seeds and much more. Must check out! 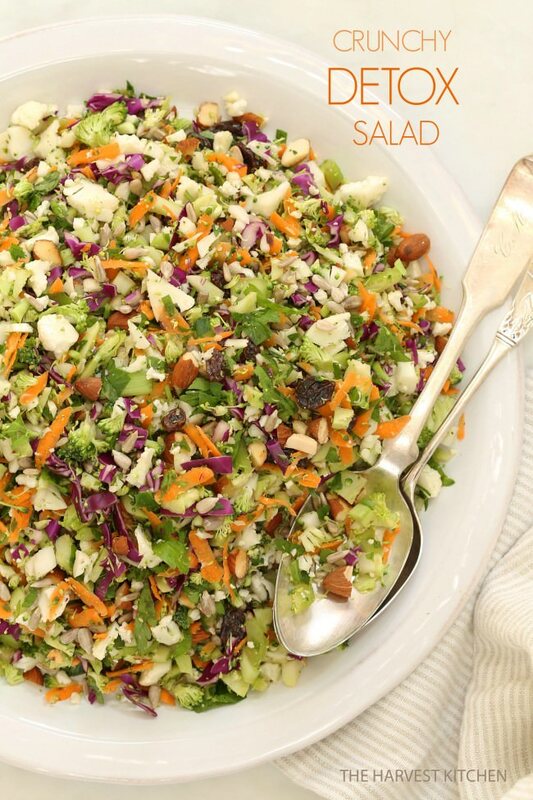 This salad is loaded with broccoli, cauliflower, parsley, carrots, raisins and sunflower seeds. You can also do some experiment with ingredients. Like the author of this post has added a fistful of chopped roasted almonds (who doesn’t love more crunch), some purple cabbage, celery, and also the honey and ginger to the lemon in vinaigrette. The key to this 3 ingredient vinaigrette is to let it sit in the fridge for about an hour (longer if you have the time) before tossing it with the salad. And you don’t believe the flavor of this vinaigrette after it’s been in the fridge for a bit is so good, you’ll want to drink it! Besides being beautiful, delicious, and fun to eat the vegetables in this salad contain nutrients and phytochemicals that stimulate the enzymes in your liver to turn toxins into something our bodies can eliminate easily.